Capoeira and Candomble is one of three book design projects (including interior layout and indexing) done for Markus Wiener Publishers, Princeton NJ. Available for order on the publisher’s website (http://www.markuswiener.com) and on various online retail stores including (http://www.amazon.com) and (http://www.barnesandnoble.com). 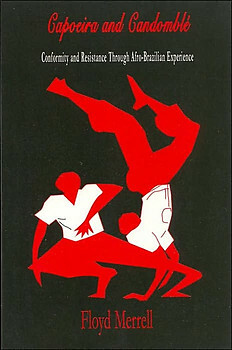 Capoeira is a unique music-dance-sport-play activity created by African slaves in Brazil, and Candomblé ‚ is a hybrid religion combining Catholic and African beliefs and practices. The two are closely interconnected. Capoeira and Candomblé ‚ have for centuries made up a coherent form of Brazilian life, despite having been suppressed by the dominant cultures. Now they are not only widely recognized in Brazil, but have become popular in North America and Europe as a new blend of sports, dance, and holistic approach to many facets of life. For Western audiences, Capoeira performance and Candomblé ‚ services are fun to watch and participate in, but difficult to understand. Both have apparently familiar elements, but this seeming conformity with the dominant cultures was for 400 years a strategy of resistance by Brazilian slaves. The author offers his own reflections about Capoeira and Candomblé ‚, combining personal experiences with anecdotes, historical facts, and research as well as religious and philosophical interpretations, both Western and non-Western. The result is informative and entertaining, a description and analysis that allows readers to get a feeling, understanding, and even experience of the spirit of Capoeira and Candomblé. Floyd Merrell, who is a professor of linguistics at Purdue University and the author of over 20 books, spends part of each year in Salvador (Bahia) in Brazil, where he practices and lives what he describes in this book.